Does the best screen make this the best Windows Phone 7 handset? Samsung's take on Windows Phone 7 was always going to be tech-heavy – and that's proved to be the case. Featuring a 4-inch Super AMOLED screen and a cool industrial design, the Samsung Omnia 7 is a slightly different take from the LG and HTC crowd. It hasn't gone big on the camera side of things like the HTC 7 Mozart, packing only a 5-megapixel camera and a single LED flash. But it's that screen that really makes things pop on this phone – it's almost like the feeling you get when you first see a Blu-ray on a proper HD telly: everything looks more real than reality itself. Yes, we've seen the same things on the Samsung Galaxy S, but for some reason the angular design of Windows Phone 7 interface really brings out the deep contrast and vivid colours more than on the Android version. The Samsung Omnia 7 is actually very similar in layout to the Galaxy S: the power/lock key is located on the right-hand side of the phone, where it's easy to access without having to jiggle the phone around in your hand too much. This is the same side as the small but easy to press camera button, which is staggered to help activate the autofocus, and is easy to use. The top of the phone houses the ports – we're looking at a pretty basic 3.5mm headphone jack and a slider switch with small piece of plastic to uncover the micro-USB slot. The uninspiring-looking camera is in the same place, although with the Omnia 7 the plastic back has been replaced with a Samsung Wave-a-like metallic option that we really like. You release this with a small switch at the bottom, and the cover simply pops up with no hassle. The right-hand side of the phone has the volume keys, or up and down navigation, which is good if you're right-handed and use the phone for sports applications in the future, but feels less intuitive for volume adjustment during calls. 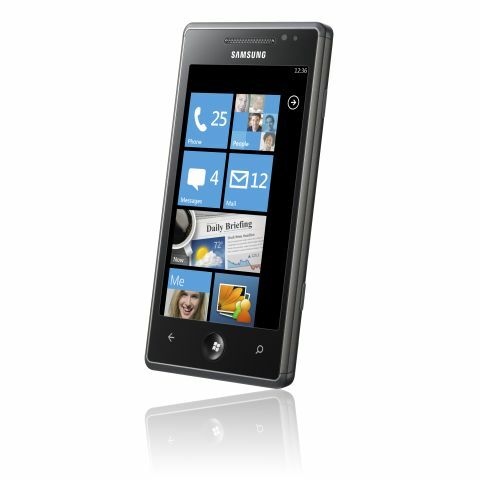 The Windows Phone 7 range has placed a real premium on the high-end feel of the handsets, and the Samsung Omnia is one of the best examples of this in our opinion. The front keys are the most impressive – there's an iPhone 4-like main home key, which is circular and concave, and the two touch sensitive buttons surrounding it are very responsive. However, they're hard to see when they're not lit up and in action, and can be hard to hit without looking. We'd rather they were also slightly indented, because it would continue the premium feel across the front of the phone and stop the Samsung Omnia 7 looking like every other Windows Phone 7 handset.